A vegan gratin to die for. Quite a dramatic statement, but not far off the mark I can assure you. Peanuts offer some much more than just a satay sauce. With vegan food like this, you’d never miss cheese or cream in your cooking, its just so rich and YUM. 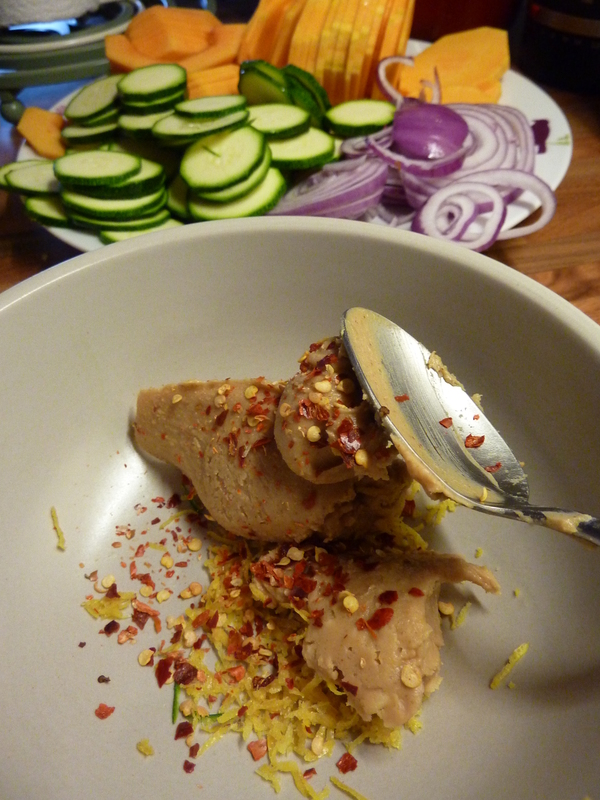 Peanut butter, in moderation, is a wonder ingredient and adds so much flavour and richness to all that it graces. A hearty bake is perfect peanut territory and a pinch of smoked paprika, chilli and garlic and you’re well on your way to a very special oven dish of happiness. It’s been a gorgeous day in Wales, a little chilly, but the sun has shone brightly. 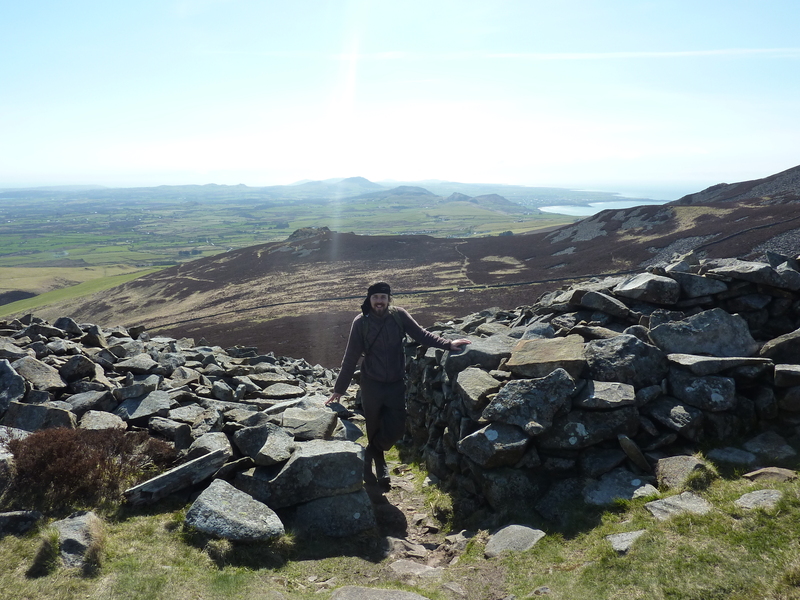 We’ve been walking all day on the Llyn Peninsula, a spectacular area just south of the Beach House. After a long day rambling around the hills, cliffs and stone age forts, we were ready for some hearty bites. We also needed some energy (those hills are steep you know!) so reaching for the jar of peanut butter sprang to mind. Peanuts are used all over the world in cooking and my favourite use of them has to be a Thai Papaya Salad (with roasted peanuts sprinkled on), however, many others also spring to mind. I saw Hugh Fearnley doing something like this a while ago and felt it worth a try, I have veganised the dish though. Hugh used sweet potatoes and double cream. I’m not a huge fan of adding lashings of cream to dishes, its a little heavy going and I find it best reserved for strawberries. I love adding paprika to dishes and we came back from Spain heavy laden with many different varieties. Smoked paprika is so powerful and works well with the chilli and peanut here, it also turns the sauce a funky pink colour. It took me a while to figure this out, but a peanut is not actually a nut, it’s a pea or legume or even herb to some. Makes perfect sense really. Although strangely, and nature can be strange, peanuts have most of the properties a nut has. Peanut butter is one of those things that just cannot be replicated, when a spoonful is added to dishes it tends to transform and can dominate proceedings. It is packed full of energy and perfect when we are out on the hills having a wee ramble. Have you ever tried making your own Peanut Butter? Its very easy and normally much more cost efficient. Grab some organic nuts and a blender and you’re off. Some peanut butter you can buy have sugar and other things added, we would steer away from these, the dish will be better with 100% peanut goodness and no added bits. We didn’t have crunchy peanut butter, so you will see a few sunflower seeds making an appearance on our version. Just to crunch things up a little. You can substitute lime for lemon here, that sounds like a tasty change. 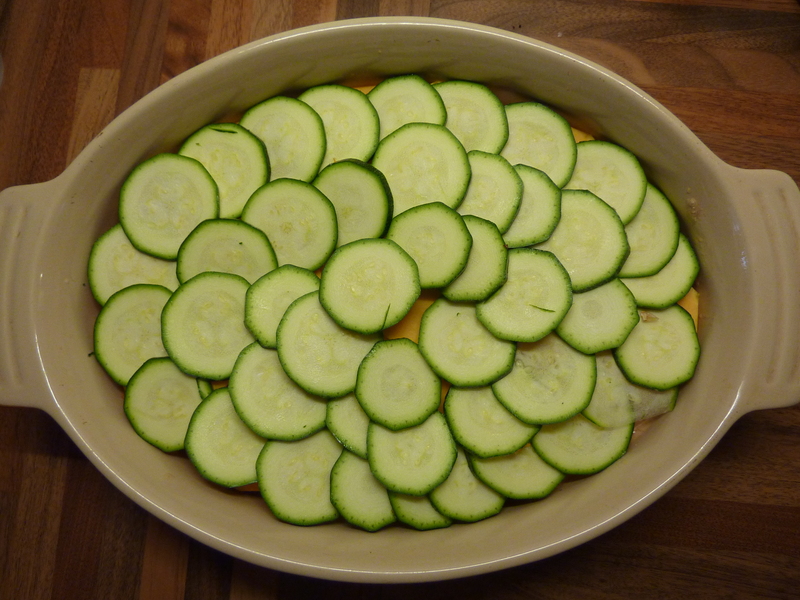 Chop up your veggies and gather a heavy oven dish (approx 8inch by 10inch). In a blender or using a whisk, combing the peanut butter, paprika, milk, garlic and lemon into a thick, double cream-like consistency. The thicker, the richer, you decide!? Butternut-parsnip-courgette-add half your mix-courgette-onion-butternut-pour over the rest of your sauce. 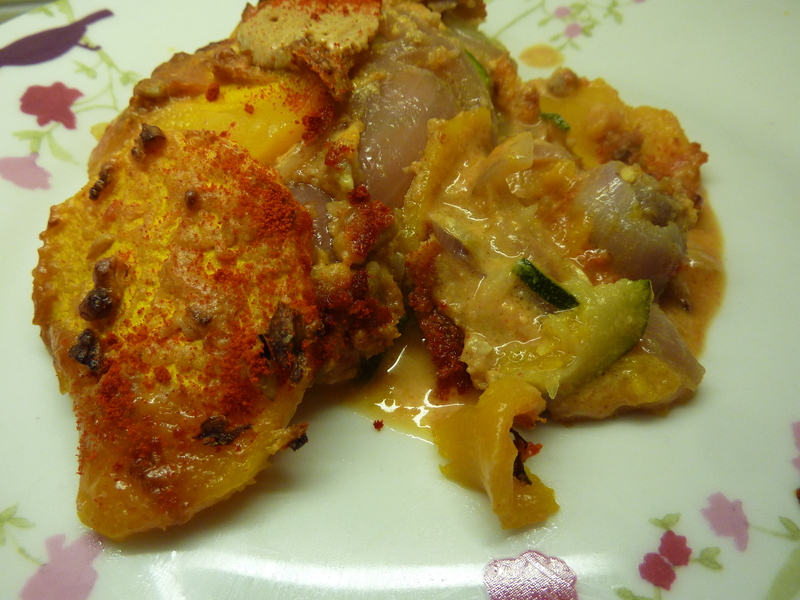 Add a few more spoonfuls of peanut butter on top and smooth them over the squash. Try and keep the layers neat and well-packed. It looks and slices better. Cover the dish and pop in the oven for 20 minutes, then take foil off and cook for a further 30 minutes or until its looking nice and crispy golden. 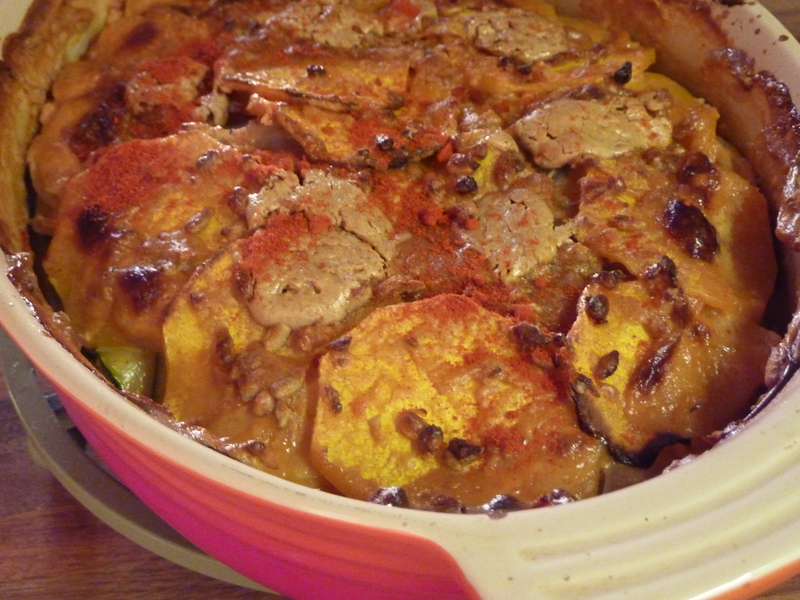 Sprinkle a little more paprika over the gratin and allow to rest and cool for 5 minutes. Then serve up with some steamed vegetables or a full flavoured salad. Creamy and rich with the lovely sweetness of peanuts and the veggies. This is full of mouthfuls to savour and bags of YUM! We suggest a full day walking over stone age forts prior to dinner. Peanuts are famously rich in energy and high in protein and vitamin B. They are also an excellent source of antioxidants (which are increased in the nut when boiled). So a handful of peanuts a day, keeps oxidisation away! Good to know. looks seriously good! do you think it would work as well with sunflower seed butter? Peanuts are a big no-go in our house! This looks amazing! I am soooooo making thiss!! I cannot wait to make this! Looks amazing! Can we pop over for dinner? Take it easy!